A Cessna 560XL Citation XLS corporate jet, 5N-BMM, was damaged in a runway excursion accident at Port Harcourt Airport (PHC), Nigeria. Two of the six occupants were injured. The airplane departed Lagos, Nigeria at 18:56 hours for Port Harcourt. The aircraft's first contact with Port Harcourt was at 19:14 when the pilot reported maintaining FL330 and estimating POT VOR at 19:40. The aircraft was cleared to POT, to maintain FL330 with no delay expected for an ILS Approach to runway 21, QNH 1011. Seven minutes later the flight was cleared to descend to FL150. At 19:27 the flight was cleared further down to 3,300ft but the pilot acknowledged 3,500ft. At 19:31 the aircraft was re-cleared to FL90 initially due to departing traffic on runway 03 at Port Harcourt. This was followed by new descent clearances first to FL50 and then to 2000ft. At 19:36 the flight was cleared for a straight-in ILS approach to runway 21 and to report on the localizer. At 19:50, when the flight had changed frequencies to Port Harcourt Tower, the controller asked 5N-BMM to confirm on the glide slope and the crew confirmed "Charlie, we have three miles to run". The Tower cleared 5N-BMM to land with surface wind calm but to exercise caution since the runway surface was wet and 5N-BMM responded "wind calm". At 19:52 the auto voice callout "minimums minimums" alerted the crew. The pilot flying, a captain, stated: "I am not on the centerline...I can't see down". The pilot monitoring, who was also captain, said to the pilot flying: "I am telling you to go down" and the pilot flying said "I will go down", five seconds later the aircraft crashed-landed. The airplane skidded off the runway and impacted a gully and a culvert, causing the right hand main gear to be sheared off. The aircraft suffered substantial damage and the main door was inaccessible, thus the passengers and crew evacuated through the overwing exit close to the starboard engine that was still running. The fire services eventually used their water hose to shutdown the running engine. The Decision of the pilot to continue the approach without the required visual references. 1) Poor crew co-ordination CRM. 2) Pairing two captains together. 3) The weather was marginal. NCAA should ensure that AOC holders do not pair two captains on a flight, provided the pilot on the right seat is right seat checked out. NCAA POI attached to the Operator should in addition to their oversight functions, ensure that all Technical crew currency are up to date, e.g. CRM, Simulator recurrency, etc. 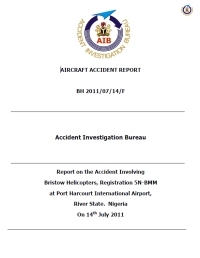 Bristow Helicopters should ensure compliance with 6 hour simulator session and one day ground school. NCAA may wish to re-examine the policy of non-inclusion of cabin crew on flights with less than nineteen passengers. NCAA should ensure that FAAN removes the concrete culvert running parallel to the runway. Distance from Lagos-Murtala Muhammed International Airport to Port Harcourt Airport as the crow flies is 435 km (272 miles).